•At the junction of Interstate 30 and U.S. highways 59, 67, 71 and 82 lies the town of Texarkana, Texas. •Arkansas border and proximity to Louisiana. The name’s origin belongs to a steamboat that voyaged the Red River in the late 1800s. •The site that Texarkana lies on is the same site the Caddo Indian village was located. The Great Southwest Trail passed by this village for hundreds of years to the Mississippi River country and back. •The city’s history and beginning development thrived because of its position on the Texas Arkansas border. •Plots of land were first sold on Dec. 8, 1873 by the builders of the Texas and Pacific Railroad. The first plot was bought by J.W. Davis. •State line Avenue separates the north and southbound lanes of this arterial road with the Texas side to the west and Arkansas’ side to the east. •Bowie County, Texas remains a dry county resulting in several liquor stores lining the Arkansas side of midtown State Line Avenue. •The city is considered one entity but has two municipalities, including two mayors and two sets of councilmen and city officials. •There are agreements for joint fire departments, respective state inspections and recreational programs. Texarkana Moonlight Murders of spring 1946. The town was sent into a state of panic that summer because of the still unidentified “Phantom Slayer.” The Texas Rangers kept watch over the inhabitants of Texarkana until they quietly and slowly left as so did the Phantom. Newton, Michael. The Texarkana Moonlight Murders: The Unsolved Case of the 1946 Phantom Killer. Jefferson: McFarland &, 2013. Print. 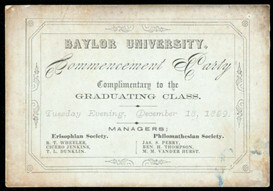 One of The Texas Collection’s earliest records of Baylor Commencement, dated 1859. 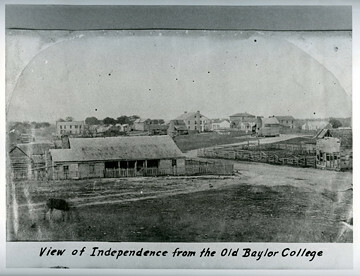 The “managers” of the party, the Erisophians and Philomathesians, were prominent (and often rival) literary societies that began when Baylor was in Independence. 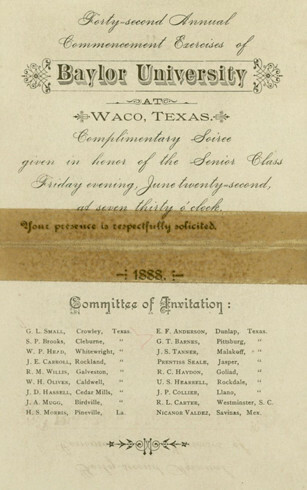 The invitation hails the 1888 ceremony as Baylor’s 42nd commencement, but Baylor actually did not graduate any students until 1854, when the Board of Trustees voted to award Stephen Decatur Rowe his degree. This invitation is a good example of the deteriorating effects of tape on paper. Of course, in Baylor’s early years, the university’s students all hailed from Texas (although many students’ families probably hadn’t been in the state for very long). But people came from all over the state to attend the fine university. That was a feat by itself, considering the small size of the school and the large size of Texas! Commencement was held in Carroll Chapel before the building burnt in 1922. This might have been one of the last graduation ceremonies hosted in what is now simply Carroll Library (and the home of The Texas Collection). In addition to the public examinations, students held debates and gave speeches. 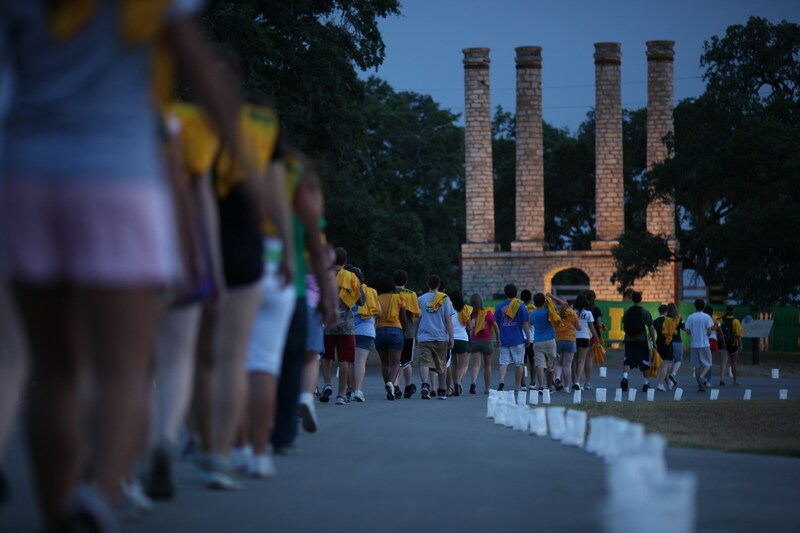 Every night of Commencement Week, there was some kind of program, with the younger Baylor primary school students participating as well as the university students. Baylor University and Baylor Female College took turns hosting the “entertainments,” which culminated with a “grand Senior Concert.” On the last night of Commencement Week, the faculty and students of Baylor University hosted a party for the faculty and students of Baylor Female College. Judge Baylor watches over the soon-to-be graduates of 1966 as they process into Waco Hall. This “crowning event of the season” was held in the Burleson Domicile, which was President Rufus C. Burleson’s home and a dormitory for male students. The octagonal shape of the building created nooks that were perfect for courting on the third floor veranda, as Hicks tells us: “The veranda was furnished with chairs and benches, dimly lighted, just the place to fill young heads with thoughts of love and romance. 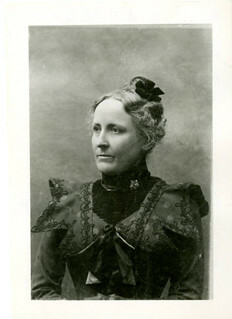 Many of the young men and maidens, knowing this would be the last meeting of the happy school days, plighted their troth, which resulted in the future marriages of some of the best people of our state.” Well, that sounds familiar—plenty of marriage proposals still happen on or around Commencement day at Baylor! And we like to think that the best people in the state (and the world!) come here. Students (and their families) come to Baylor Commencement from all over the world now, and the official Commencement ceremonies don’t span a week anymore. But the thrill of sending new Baylor graduates out to “fling the green and gold afar” hasn’t changed since Baylor graduated its first student in 1854. Congratulations, class of 2012!